I can probably count on two hands the number of times I’ve intentionally run with others when it wasn’t during a race. I don’t mind running with other people, I just like (and need) the flexibility to go when I’m ready. And yet, I always feel a twinge of something (Jealousy? Admiration? Curiosity?) when I see groups of runners out together. I read often about the benefits of group runs and I know that I could definitely improve if I could run regularly with someone faster than me. In short, I know that I would like access to a running community. The crazy thing is that I’m pretty well surrounded by running communities and I’m a member, albeit slightly inactive, of the local Annapolis Triathlon Club. The running communities that I’m surrounded by however, are about 15 miles or more from my house and the group runs tend to start at times that just don’t work with my schedule. So I’ve never really been involved. This all seems to be changing. I’ve been a regular customer at Fleet Feet Annapolis for years for new shoes, running gear and to participate in some of their events. And often I’ve talked with the store team, usually hypothetically, about when they might open a location in Severna Park, my hometown just north of Annapolis. I thought, if there could be a Severna Park location, then I would have a running community. And then, at the June Father’s Day 10K in Severna Park I heard news that indeed Fleet Feet Annapolis was opening a Severna Park store! I tracked down the news and found the address for the soon-to-be store location and kept my eyes peeled for a ‘Coming Soon’ sign. 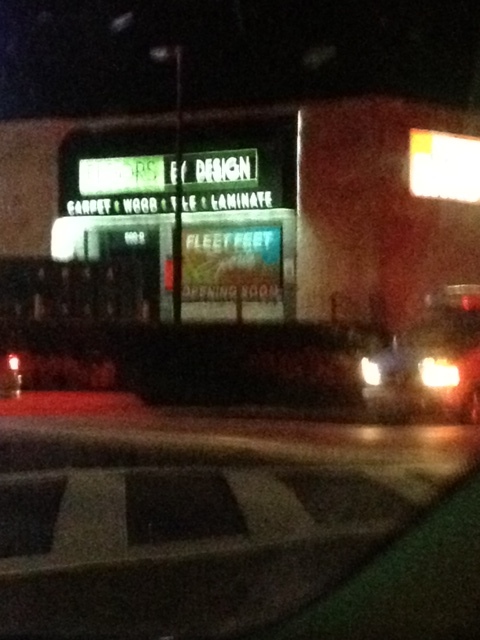 One day on the drive home from work, waiting to turn left into my neighborhood, I looked up and saw a big huge Fleet Feet banner: Opening Soon! The store location was a half a mile from my house! Running nerd that I am, I quickly envisioned myself running up to the store to buy new gels, socks, shoes, gear. I pictured myself not only joining, but leading group runs. I thought about the day I might take my son there for his first pair of running shoes and the days we would go there together to join group runs, Turkey Trots and all the other community and family-oriented running events Fleet Feet is known for. And so I thought, what better way to share my enthusiasm than with the store owner! 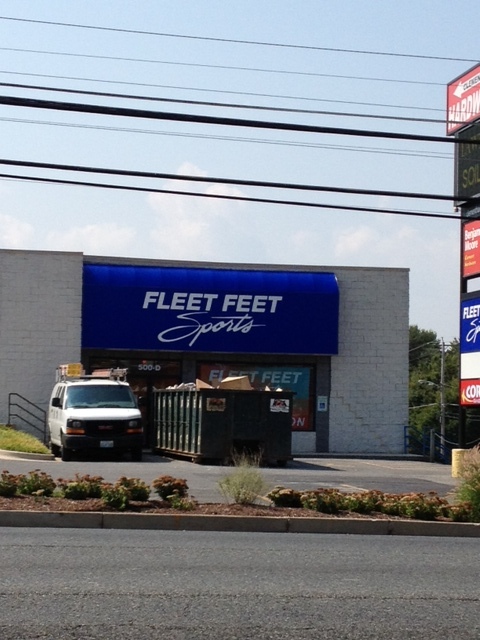 I immediately reached out to Scott Broerman, owner of Fleet Feet Annapolis and now Fleet Feet Severna Park, and asked if I could do an interview. I’ve met Scott numerous times both in his store and at running events and he is always the most calm, cool and collected person around. He is a known entity in the local running community and I look forward to filling my “running void” with all that his Severna Park Fleet Feet will have to offer. I hope you enjoy getting to know Scott as much as I have and I really hope to meet you as part of a newly found, and greatly needed, Severna Park Running community! HR: How long have you been running? SB: I started running when I was 18, so over 35 years now. I ran to get ready for a military physical readiness test…no other reason. My passion for running evolved over the years and after I met my wife (a two time Olympic trials qualifier) my competitive runner kicked in. SB: 10K…there are not enough of them. HR: Could not agree more. In fact, I’m thrilled that the Bay Bridge 10K is coming back in 2014 (I signed up as an early bird in Fleet Feet!). HR: Do you have a favorite race (distance and/or location)? Scott, co-owner of Fleet Feet Annapolis & Severna Park welcomes runners for a St. Patrick’s Day run. SB: Favorite race? No, not really…anything local where I can see our running community in action. With four kids and now two stores it is often hard to be at the events I want to be at and often I have to sacrifice running races to attend football practices, swim meets, etc. Kids and family time come first. But, I get out there when I can. HR: I think you’re being modest. 🙂 I see you, and the Fleet Feet team including your family at a lot of events. I think it’s awesome to know that you’ll be seen every year at the same spot along the A10 course, the Zooma half marathon and so many other local races. HR: How many races have you done? HR: I love that you’ve lost count. I hope to say that one day! 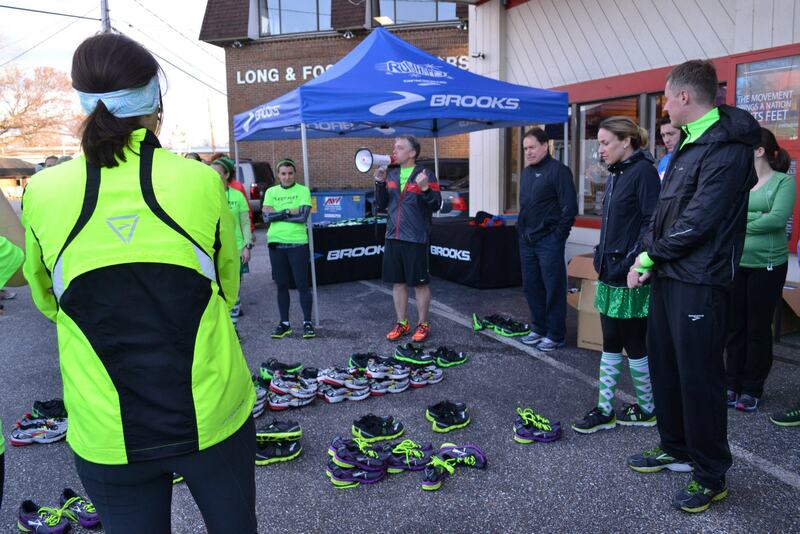 HR: What inspired/motivated you to open Fleet Feet Annapolis? SB: That is a very long story. We started applying for a Fleet Feet store in Annapolis in 1999. We were not awarded our franchise until 2005 and it was a year after that that we were finally able to open our doors. My wife and I just love running and paying it forward by being part of our community (my wife was born and raised here) was a natural step for us. Now we are able to live our passion every day, provide local employment opportunities, watch our staff grow and move on to bigger and better things and provide for our family. That is living the dream right? HR: It is the dream. I guess I can’t open a running store now in Severna Park! 🙂 In all seriousness, living the dream is a lot of work. You get to do what you love but there’s no doubt that running a business is also a lot of work. Especially retail which is why I imagine the community aspect makes it so rewarding. You get to see people regularly who help keep your dream alive. HR: What have been some of the best changes/growth with that store over the years? SB: The Annapolis store is constantly evolving. We learn something new every day. We experience our community hands-on each hour we are open. Our staff is educated and willing to help change lives. That has helped us grow. We continue to grow in Annapolis and enjoy a reputation of being the best fitters in our community. The Annapolis community being the modest size it is and having four different running specialty stores presents its own day-to-day challenges. But having that competition makes sure we are always innovating and working hard to be the best. We are not a chain and what we do is a representation of ownership, passion and a great staff that genuinely cares. HR: You definitely have an interesting challenge and opportunity all at the same time. You seem to have great partnerships with the brands you carry like Brooks, Under Armour and Moving Comfort which help to keep traffic coming into the store. I also think you’ve managed to keep a personal touch through emails and social media while also responding to the needs and interests of your customers. HR: What have been some of the biggest changes you’ve seen in running over the years? 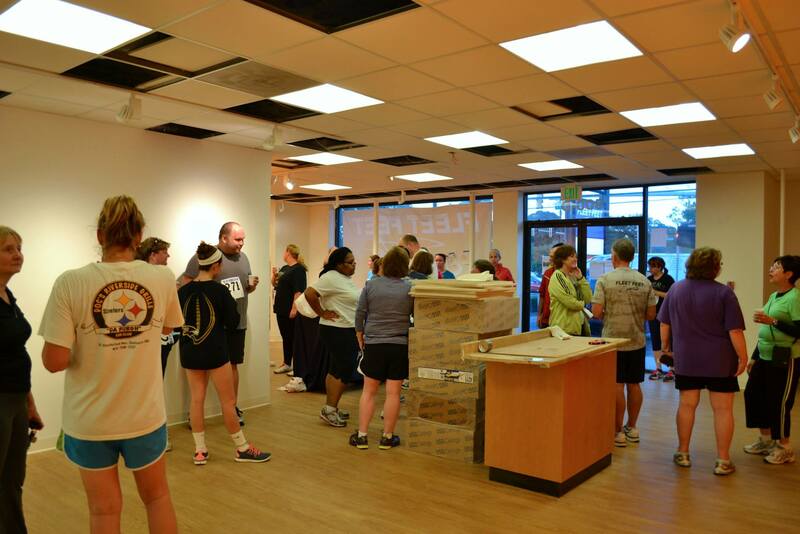 Runners gather in the new Severna Park Fleet Feet store even before it’s open. SB: It seems to me more and more people want to run longer and longer. Seven years ago no one would have challenged themselves to a 100 mile run. Today it is the goal of many runners. The marathon has become another distance that seems to have been added to many runners’ bucket list over the years. I myself had no desire to run a marathon until we opened our doors. Now, with four of them under my belt I want more. I see runners constantly challenging themselves to other goals too. Triathlon is one of them. So many runners now are multisport athletes. That is just way cool. That they can manage their time to pursue those goals is just awesome! Runners are more educated now too. They do their research and seek new ways to improve. So, biggest changes? The growth of the sport…running has become fun, running has become social and running has become a part of everyday life for so many and they pass that drive and enthusiasm to new runners as well. Way cool…just way cool. HR: Your passion is contagious! Could not agree more!! HR: What motivated/prompted the opening of a Severna Park store? SB: We ran the numbers and figured out that while Severna Park and Annapolis are close, they are separate communities. We love being a part of a community. When we opened up Annapolis seven years ago we went and researched Severna Park first. It was not the time to put a Fleet Feet there at that time. Now, with the growth of running and the community it was time. HR: Selfishly, I’m glad this happened. There’s no doubt it’s a different community. Annapolis has great running areas through Quiet Waters Park, Eastport and the Naval Academy. Severna Park has the B&A trial and the neighborhoods that offshoot from it. Not that the running routes make for different runners but in a way, it does form different running groups and needs. Severna Park, in my opinion, has needed your store for a while…not only to serve the running community but to help grow it. HR: How long has a second store been a vision? SB: I would say we started talking about a second store three years after we were open in Annapolis. Now our vision is a third. HR: What do you hope to achieve/influence in the Severna Park running community? SB: Starting the community on a path to fitness through running or walking. 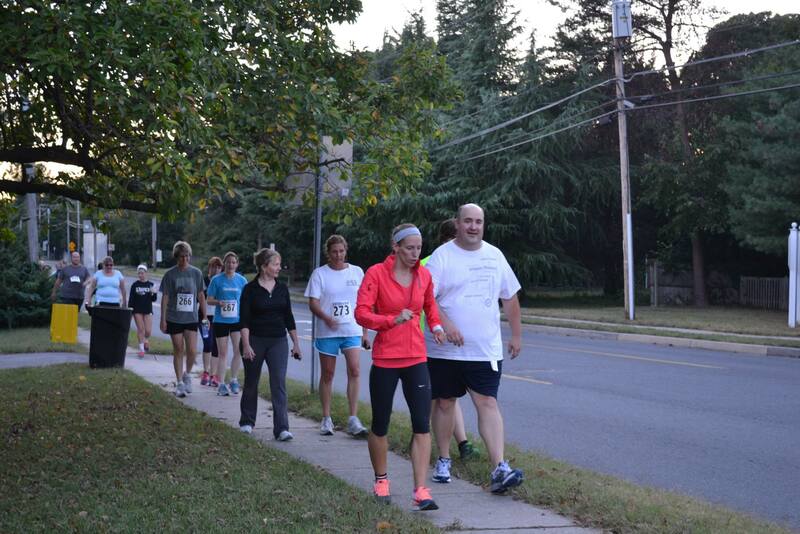 We started our “Make it a Mile” program mid-September in Severna Park before the store was even open. 41 people have joined…these are people that are just starting and have never walked/run a mile and some that are trying to get back into the swing of it. 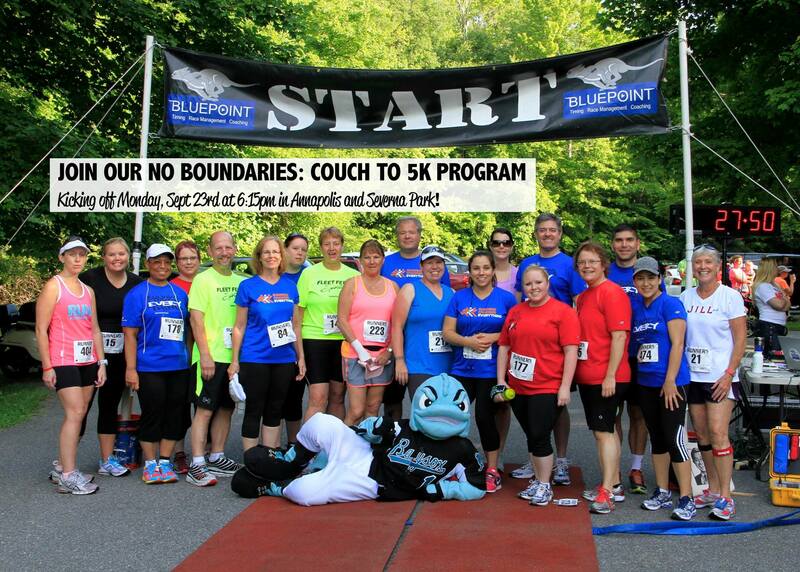 That program will be followed up by offering our “No Boundaries” couch to 5K program. No Boundaries is a national program within Fleet Feet stores sponsored by New Balance. We have about 400 graduates of No Boundaries in Annapolis. Watching the coaches and mentors working with new runners is so very rewarding. The passion that is put into helping one another is infectious. We want to help influence people to shop local as well. When they shop local they are supporting their own community. Putting money back into where we live just makes sense on such a big scale. I think our customers in Annapolis get that and that will always be a successful business strategy. Fleet Feet “Make it a Mile” participants on the B&A trail in Severna Park. HR: I love that the business model has so much to do with building relationships among a running community and helping runners achieve their goals. There was a great quote at some point in Runner’s World about when someone could call themselves a runner. And the answer was literally, something to the effect of, “when you have gone for a run.” It could have been a five minute run. And you might not have gone far. But the ownership someone can take from having gone for a run, that is hugely rewarding. And you’re helping people do that. By default they will be loyal to you. HR: How will you celebrate the grand opening of the store? SB: We have a three day grand opening event planned right now. Our marketing director has an hour-by-hour schedule developed utilizing our very generous vendors and partners in the community. It’s gonna be great. November 1-3rd is on the schedule for the grand opening. Our soft opening is just around the corner. HR: What will the hours be? HR: So far you have Tues runs at 6:30pm and Sat runs at 8am; will that continue through the winter and will you have additional times as the groups grow? HR: Popular brands of shoes and gear that you’ll have? HR: Yes! Runners—do not expect to get the right gear or service from a non-running specialty store. But quickly on Hokas. They were the title sponsor of a race I just did and I learned a lot about them from the rep there. I will definitely come try out a pair and may have to make a serious consideration of these shoes (I’m a Nike addict). We can do a follow-up post about their unique design and benefits. HR: Anything else you’d like to share? SB: Severna Park, get excited because we sure are. Can’t wait to be able to support and be part of such a great community! Welcome Fleet Feet Severna Park! This entry was posted in Articles, Running on September 21, 2013 by Natalie.